One of the most fascinating aspects of drumming is the almost open-ended nature of the kit itself. Essentially, a drum kit can be whatever you want it to be, from a small three-piece setup to a massive tom tom-laden monster. Thankfully for us, most drum grooves and patterns can be recreated on a basic kit with a core set of standardised drum and cymbal sounds. The former comprise a bass drum, a snare drum and two or three toms, while the cymbals will typically consist of a set of hi-hats, a ride cymbal and one or more crashes. Your drum ROMpler will be packed with sounds in all of these categories, providing a level of sound-selection flexibility that you'd struggle to match even in the most well-equipped real-world recording studio. If you're looking to program truly realistic drum parts, one limitation you should always bear in mind is the physicality of the drummer him/herself - we're referring here to the 'four-limb limit', or in other words, the obvious fact that a drummer can only play a maximum of four kit elements simultaneously. Not only that, but if you watch a drummer play a drum kit, it soon becomes apparent that their four limbs are assigned to specific roles, further limiting your flexibility. Quite simply, the kick drum and hi-hat foot pedals take up two of the drummer's available limbs, leaving you two arms with which to play everything else. Let's take a quick tour of the drum kit, looking at the sounds available and how they're played. 1. Here's a typical drum kit layout in FXpansion's BFD 3. One foot plays the kick (bass) drum and the other foot controls the openness of the hi-hats. That leaves the hands to play the snare, hi-hats, toms, ride cymbal and crash cymbals. In a groove, one hand plays the snare and the other the hats or ride, while in a fill, both hands play the toms and crashes. 2. The sound of the snare drum is one of the most important aspects of any track. Your ROMpler will probably offer clean snare hits as well as rimshots, which strike the head and rim together for added punch. You might also get different snare articulations. To allow you to program natural-sounding parts, snares are typically more deeply sampled than other drums. 3. Further common snare drum variants include the sidestick, where the tip of the stick rests on the drum head and the shaft strikes the rim. There are also stick variants such as brushes and rods, both of which provide a less punchy sound. 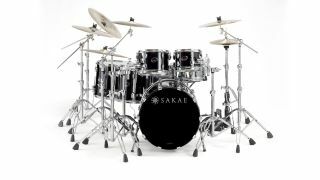 These will have an obvious effect on the main snare backbeat, but will also influence the other drums and the cymbals. 4. For the most part, the kick (or bass) drum provides solidity and an anchor for the whole groove. It might play on beats 1 and 3 for rock and pop, beat 3 only for reggae, or all four beats for dance music, to give three very general examples. The sound of the kick drum is affected by the type of beater used to strike it, the most common options being wood or felt - wood produces a harder, brighter tone and attack. Your ROMpler may well feature both. 5. The hi-hats are a pair of small cymbals held together on a stand by a pedal-operated pull-rod. The pedal controls how tight the two cymbals are, from clamped shut to fully open. Controlling this pressure while hitting the top cymbal can produce a variety of sounds. Hi-hats can also be played just by closing them with the foot pedal, for a less up-front sound that serves a different rhythmic purpose. 6. The ride cymbal is used as an alternative to the hi-hats, typically playing the same pattern (straight eighth-notes much of the time) but with a much more sustained sound. Playing articulations include the tip on the main body and the 'shoulder' (just below the tip) on the bell for accents. You can also use the body of the stick on the edge of the cymbal for big, gong-like tones. 7. Most drum kits include at least one rack tom and one floor tom, although you can have many more if you wish. You can use a (usually floor) tom to beat out a rhythmic pattern along with the kick and snare (replacing the hi-hats), but more typically, you'll be rolling around them from one to the next for fills. 8. Crash cymbals are used for accenting specific points within a pattern, and you'll most often find them at the beginning of a bar and/or phrase. They're hardly ever struck on their own -in the audio example, you can hear one crash with a kick and another on its own, highlighting the difference in impact. Crashes can also be choked at the end of a passage for a tight finish.